A variety of needs could be addressed and problems resolved with the plan to expand the Boone County Courthouse, county officials and architects said Monday night. The project was explained by the County Commissioners and architects Larry Goldberg and Brad Kessler of Cannon Moss Brygger & Associates during the first of seven information meetings planned throughout the county in a nine-day span. Restrooms and other areas of the courthouse do not meet accessibility requirements of the Americans with Disabilities Act. Ducts above the ceiling should be replaced for proper operation of the heating and air conditioning system. However, if the replacement is done in that area, fire regulations would require installation of a fire sprinkler system throughout the courthouse. The courthouse space is not adequate to house all current elected and appointed officials and their staffs. Thieman pointed out that offices added to the courthouse since it was built in 1976 include zoning, economic development, highway superintendent, county attorney, probation officer and driver’s license examiner. Storage space in the courthouse is full, and the county now rents off-site storage space for items such as the voting machines used in elections. 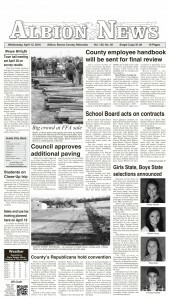 Courthouse and courtroom security are primary issues for Boone County. Currently, jail inmates must be brought to the courtroom through a public hallway. The Nebraska Supreme Court has mandated that inmates not be mingled with the public at any time on the way to or from the courtroom. 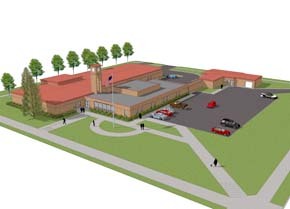 The courthouse addition would resolve that situation with a secure hallway connecting the Sheriff’s office/jail with the courtroom and related offices. Legislation has been proposed to consolidate county governments in the future. If that would occur at some point in the future, Thieman said, Boone County would have a better opportunity to be a “host county” with expanded facilities. More details in Albion News Print Edition.